I posted recently on maternal behaviour in spiders, but I when I came across this I knew another post was in order. The photo above shows what is is most likely a Gnaphosidae spider with her eggs in her nest on the 19th of July. 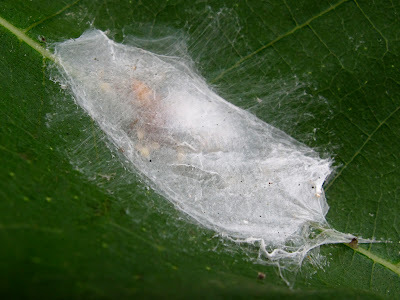 The spider has wrapped herself inside a silken nest she has made for her eggs, and she will remain there until they hatch and the spiderlings disperse. This behaviour, called 'egg guarding' is present in many spiders. Why would a spider do this? Do the eggs benefit in a any way from their mothers behaviour? There is anecdotal evidence in related species that unattended eggs are predated, but little information was available on who the predators are until Simon Pollard carried out some experiments on Clubiona cambridgei, an endemic species from New Zealand displaying this egg guarding behaviour, and the results were surprising. Simon had noticed that sometimes Clubiona spiders were found inside or just outside nests with eaten eggs and suspected that individuals from the same species were actually the egg predators. Egg predation seems an unusual behaviour for spiders, who are considered hunters of active organisms. He wanted to test the hypotheses that (1) spiders eat eggs from their own species - a form of cannibalism - and (2) egg guarding represents a defensive mechanism that decreases the chances of conspecific predation. He carried out simple experiments with egg nests - easily collected in this species as it is abundant and nests in folded out flax leaves. His results were conclusive. Nests where mothers had been carefully removed (therefore, unattended) and then were exposed to non-breeding females were all predated, with all eggs eaten within 16 h. Males or breeding females did not eat unatended eggs. When nests were attended, males and non-breeding females quickly retreated when noticing the activity of the guarding mother and no egg predation took place. 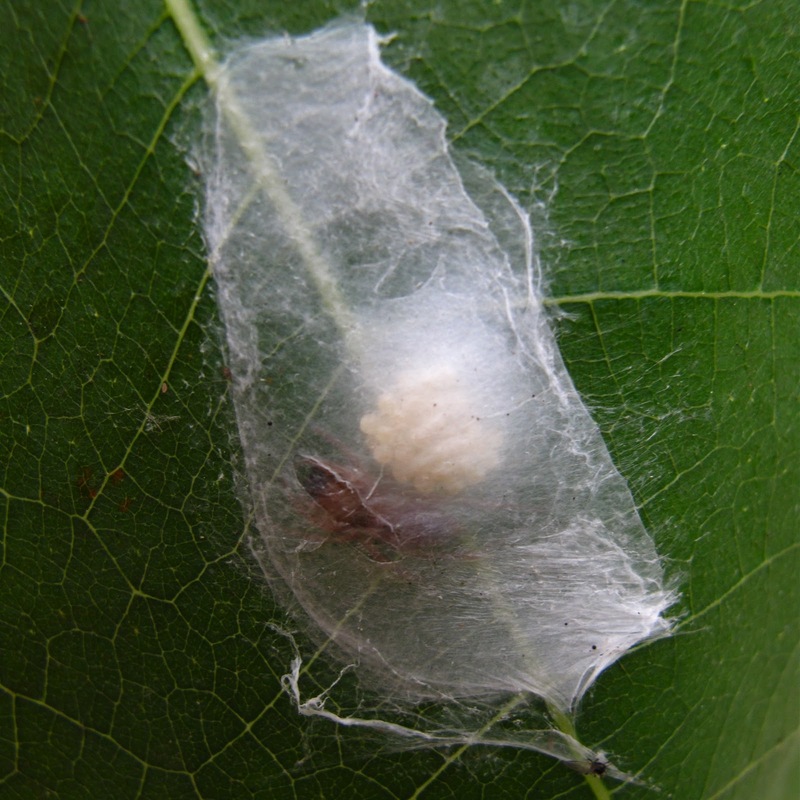 Therefore egg guarding in Clubiona is indeed a strategy to protect the eggs from other spiders predation. More recently, cannibalistic egg predation has been documented in 12 spider families - including Gnaphosidae -, and therefore, egg guarding behaviour is likely to have the same defensive function in these spiders against cannibalistic predation. My spider successfully defended her eggs, and yesterday, I could see the pale, tiny spiderlings through the nest walls. Cool. I didn't think they were protecting their eggs from their own species, but it makes sense, sort of - one less clutch to compete with your own, and a protein boost to help generate eggs of your own.